Thank women, host Alicia Keys, and director Louis J. Horvitz for the most entertaining show in some time. The Grammys are the most unpredictable of the major awards shows. Depending on the year, they might be a raucous, fun party or a horrible snooze — or they might land anywhere in between those two poles. After the 2018 Grammys were among the worst ceremonies in recent memory, it was tempting to expect this year’s awards would be, at best, only a slight improvement. Instead, they were sprightly and fun, zipping along from big moment to big moment. Yes, they ran over their three-and-a-half hour time slot by nearly 15 minutes (an unforgivable offense when you’re scheduled to run three-and-a-half hours in the first place), and yes, they made some curious decisions here and there (like having Jennifer Lopez headline a tribute to Motown? ), but for the most part, this was the most captivating Grammy ceremony in quite some time. And it certainly didn’t hurt that the winners were solid, too, capped off by twin prizes for Childish Gambino’s searing “This Is America” in the Song and Record of the Year categories and an Album of the Year prize for Kacey Musgraves’s swooning Golden Hour, which by some measures was the most acclaimed album of last year. So what was it that made the Grammys so good this year? Here are three key choices the awards made to create an enjoyable show. Shortly before the 2019 Grammys were awarded, the annual Pazz and Jop poll — in which music critics are surveyed about the best music of the year — was finally released for 2018. (The poll, typically released much earlier, had been delayed this year because the Village Voice, which hosts it, folded in August, though it still hosts Pazz and Jop for some reason.) And for the first time ever, the top five albums on the list were by women artists, with two other solo women artists and Low, a frequently woman-fronted band, appearing in the lower half of the top 10 as well. But even beyond the Pazz and Jop winners, the evening was a big one for women at all levels of the industry. Up-and-coming pop star Dua Lipa won Best New Artist, and the evening’s performances featured a fleet of the music industry’s most talented women performing either their own music (Lady Gaga! St. Vincent! Dua Lipa!) or the music of women who just happen to be music legends, including an electrifying tribute to Dolly Parton and a lovely remembrance of the late Aretha Franklin, whose death hung over the whole ceremony. Hell, for the first time ever, a woman won an award as master engineer of an album, when Emily Lazar won as part of the engineering team behind the Beck album Colors. But in a year when the most acclaimed music was made by women, when the industry was rocked by the loss of Franklin, and when Diana Ross was turning 75 in a month (an occasion she marked during the ceremony by proclaiming, “Happy birthday to me!” after performing a tribute to herself, by herself), the Grammys knew to just get out of the way. Next year, the show could very well go back to the same old, same old, but in 2019, the Grammys were happy to show off just how many talented women are working in so many different segments of the music industry. 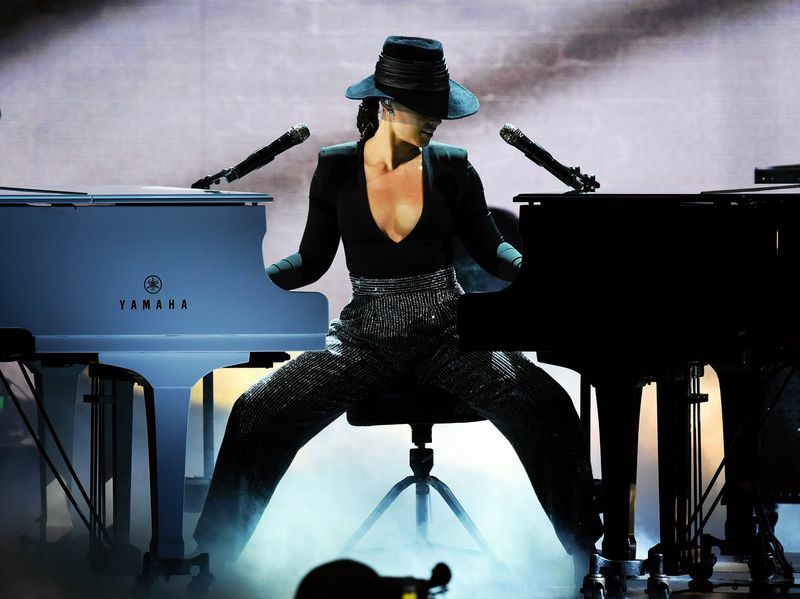 Alicia Keys performs on two pianos at once. Two! This might prove to be a controversial statement. It certainly was in the Vox Grammys Slack, where opinions on Keys as the show’s host ran hot and cold. 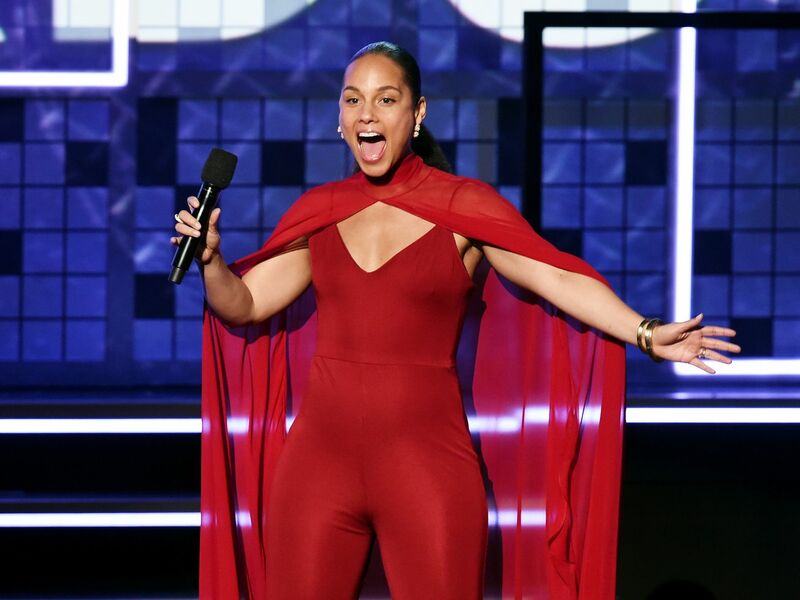 But honestly: Alicia Keys was the perfect Grammys host, and the show did a great job of not trying to make her break too wildly from what she does well. Yes, she was sometimes a little too subdued. Once, she seemingly wandered around the stage mumbling the word, “Childish!” after accepting Childish Gambino’s Song of the Year trophy because he wasn’t at the ceremony. And occasionally, she didn’t seem to realize the show had returned from a commercial and continued to chat with the audience. But those moments all felt of a piece with her overall hosting job, which was aimed less at making her seem funny and more at making her seem like a terrific recording artist. She offered up a faux-moving tribute to the 2004 Grammys, when she lost Song of the Year to John Mayer (for his putrid “Daughters” — see what I mean about the Grammys so often getting it very wrong?). She presented the final two awards of the evening in brisk, efficient fashion but still found time to shout out Lauryn Hill’s The Miseducation of Lauryn Hill. Keys’s dual piano performance was the sort of moment that either mesmerized you or sent you scrambling for the remote, but for me, her sheer virtuosity, combined with her seeming unwillingness to play to the cheap seats, made for a fun performance — and a deeply entertaining Grammy ceremony more generally. This was Alicia Keys’s party, and weren’t we lucky to be invited over to hear some of her closest friends perform their hit songs? I honestly don’t know why the 2019 Grammys were so well directed. I’ve spent the last several years griping about the Grammys’ general inability to offer solid live TV direction, but this year’s awards had terrific live TV direction. I assumed this was because the show had switched directors, but Louis J. Horvitz, who helmed the 2019 telecast, has directed every Grammy telecast since 2010. Whatever the case, Horvitz’s work on the 2019 Grammys was terrific top to bottom. The Grammys clearly think of their telecast as the world’s biggest, most star-studded concert, but the direction in recent years has robbed viewers of the feel of a concert, where you can take in the whole stage at once — the better to check out the dancing, the production values, and the charisma emanating from the star. Instead, the show has often cut frantically between medium shots and close-ups, often creating a hyperactive editing rhythm that made it hard to tell what was going on. The 2019 Grammys had far fewer problems in this regard. Horvitz often zoomed out from the action, letting viewers drink in everything that was happening onstage in majestic wide shots. When it was time for, say, Lady Gaga to let out the famous howl from “Shallow,” he’d cut in closer, but he chose his moments judiciously. He even came up with a few fun shots on the fly, as when a camera circled St. Vincent and Dua Lipa as the two performed their duet, creating a sense of intense, sizzling tension. No matter the reasons for it, Horvitz’s direction was the sneaky, secret success behind the whole evening. It’s a lot easier to appreciate the thought that goes into staging these Grammy numbers when you can actually see them, and Horvitz was careful to make sure viewers were right there at the concert, getting the full experience, from the cheap seats all the way up to the front row. Jennifer Lopez performed the Grammys’ Motown tribute. Motown fans were not pleased.